Almost everything at Google has been running on containers for more than a decade . Google identified the importance of using Linux containers for efficiently utilizing underlying infrastructure more than virtual machines at very early stages. They contributed to the Linux kernel for implementing container technologies such as cgroups, namespaces and even implemented their own container stack (lmctfy). At the moment Google is spinning nearly two billion container instances a week across their global data centers . According to a Google network engineer , these data centers are having a capacity of nearly 75,000 machines with over 1 petabit per second (which is around 125,000 gigabytes per second) bandwidth in each. Google has been using containers at such massive scale with the help of several container cluster management systems over the years. Initially, two separate systems called Babysitter and the Global Work Queue  were developed. Babysitter was designed to run long running services and Global Work Queue was designed for executing batch jobs. These are the main two types of tasks needed for implementing most of the software applications. Later on, Google replaced those two systems with Borg with the intention of introducing a more unified container cluster manager. Borg is Google first proprietary, unified container cluster manager. It includes a set of master nodes, a set of slave nodes, a CLI, and a web-based UI. All of the server components have been written in C++. The master provides an API to let the CLI, UI and other external systems to communicate with the cluster manager. In each slave node, an agent component called borglet is installed for managing containers, networking & routing. The scheduler takes container scheduling decisions based on the resource availability of the slave nodes and executes those via borglets. The state of the system is stored in Paxos, a distributed, highly available persistent storage. 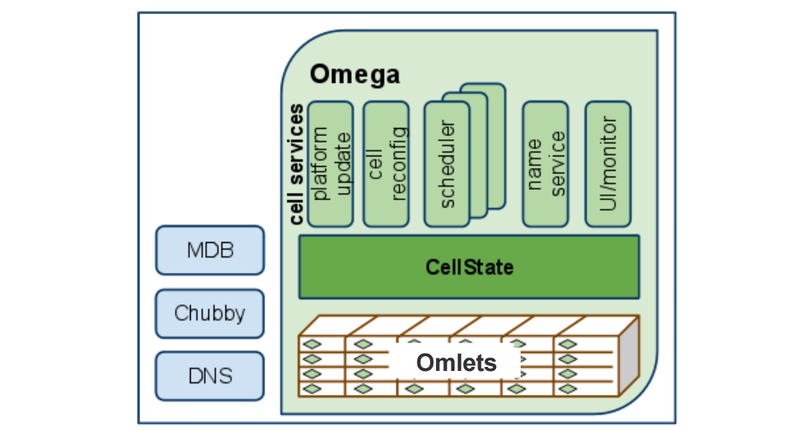 Omega is Google’s second generation, proprietary container cluster manager. It was designed and built ground up, with the intention of improving the engineering and the architecture of the Borg system. It took almost all the container cluster management features of Borg and implemented those slightly differently for improving performance. Mainly it has improved two aspects of Borg; the way the cell state was persisted and the core scheduling architecture. Borg used a monolithic persistent model for storing the cell state inside the master. In Omega, it was moved out and managed as a separate centralized Paxos-based transactional store. This model allowed cluster manager features to be decomposed into separate components and interact with the persistent storage as peers . This complies with the microservices architecture. Overall it provides a much efficient way of executing cluster manager component logic on the cell state, such as taking scheduling decisions as those can be executed in parallel with required level of concurrency and transaction management. 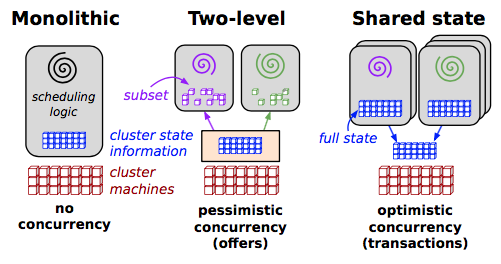 Introduction of the external cell state persistent model allowed multiple schedulers run against the same cell state with optimistic concurrency controls. Google has analyzed above approaches in research paper  and found that shared cell state model allows optimizing scheduler busyness and job wait time significantly. In year 2014 Google started Kubernetes project with the intention of implementing a general purpose, open source container cluster management system by incorporating the experience they had with Borg and Omega systems. 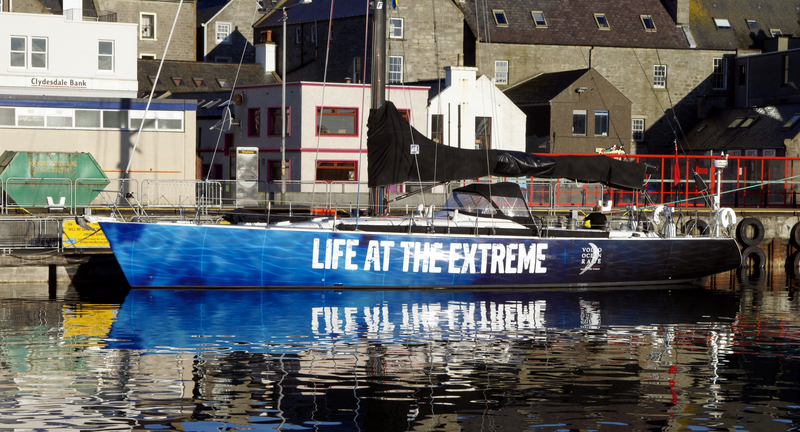 The name Kubernetes originates from Greek, meaning “helmsman” or “pilot”, and is the root of “governor” and “cybernetic” . It took the architectural concepts from Omega such as master-slave separation, shared persistent storage, multiple schedulers, agent component in slave nodes, dynamic DNS management, etc and implemented those using latest technologies. The entire system was written ground up, using Google’s latest system programming language Go. It reused existing open source technologies such as etcd; a distributed, reliable key/value store for centralized persistence storage, flannel for implementing the overlay network, cAdvisor for monitoring resource usage in slave nodes, InfluxDB for persisting resource usage statistics, Grafana for implementing monitoring dashboards, etc. The project is lead by Google, RedHat & CoreOS with the involvement of many other large organizations. At this moment, it has around 29,000 commits, 46 branches, 122 releases with around 800 contributors. Another important aspect of cloud computing is implementing multi-region/cloud deployments for high availability and distributed processing. Kubernetes has addressed this feature by implementing a separate control plane called Ubernetes on top of Kubernetes as shown in the above figure. Ubernetes exposes a separate API for managing such deployments with advanced cluster management features such as location affinity, cross-cluster scheduling, cross-cluster service discovery and cross-cluster migration. Google has been using containers in production for more than a decade. They used several systems for this over the years; Babysitter, Global Work Queue, Borg, and Omega. These systems have been running on massive scale at Google data centers with efficient resource utilization techniques. However, all of them were proprietary and specifically designed for Google infrastructure. Google started Kubernetes project in the year 2014 with the intention of implementing a general purpose container cluster manager by involving other interested organizations. Within this short period of time Kubernetes has evolved rapidly and has become the best container cluster manager in its class.